The objective of this study was to compare between vaginal progesterone and calcium channel blockers (CCBs) in the prevention of preterm labor in patients with a short cervix. Preterm birth (PTB) is defined by the WHO as onset of labor before 37 completed weeks of gestation. The incidence of PTB is variably reported between 5 and 11% of all births, and its prevention continues to remain elusive, with many reports indicating an increase in the prevalence of PTB over recent years. One hundred fifty pregnant women were arranged in three groups: placebo group; the CCB group, in which patients received nifedipine 20 mg four times daily; and the progesterone group, in which patients received 200 mg of micronized vaginal progesterone daily. There were statistically significant differences between progesterone and CCB regarding the prevention of PTB and treatment of PTB, with a P value of 0.000; a higher number of women experienced improvement in the progesterone group, with 60% of women having no PTB and only 6% having very early preterm birth. Vaginal progesterone was better than nifedipine in the prevention and treatment of PTB in women with a short cervix. Preterm birth (PTB) is defined by the WHO as onset of labor before 37 completed weeks of gestation . The incidence of PTB is variably reported between 5 and 11% of all births, and its prevention continues to remain elusive, with many reports indicating an increase in the prevalence of PTB over recent years . Many factors have been implicated, including an increase in maternal age and use of assisted reproductive techniques, with resultant increases in the risk of multiple pregnancy, increasing maternal BMI and the influence of obesity; continued maternal smoking during pregnancy; and infection . The exact mechanism of the onset of both term and preterm labor in humans is a complex interaction of many different hormonal pathways, culminating in co-ordinated uterine contractile activity, mediated by the production of prostaglandins . Progesterone has an essential role in maintaining pregnancy, primarily through establishing uterine quiescence; this is achieved through suppression of the calcium–calmodulin–myosin light-chain kinase system, reducing calcium flux and altering the resting potential of smooth muscle . There is considerable debate about the relationship between progesterone withdrawal and the onset of labor . Calcium channel blockers (CCBs) are responsible for the majority of the observed calcium current in the human myometrium. The Ca 2+ channels are complex proteins composed of five distinct subunits (α1, α2, β, δ, and γ) encoded by multiple genes . Dihydropyridines (DHPs) such as nifedipine bind to the DHP-binding side of the voltage-gated L-type channels, which is located on the α1 subunit. The channels have several isoforms resulting from alternative splicing sites of the α1 subunit . This study was carried out at El Menofiya University Hospital after approval of the ethical committee and after obtaining informed consent of patients, during the period from May 2012 to March 2015. One hundred fifty pregnant women were arranged in three groups: placebo group; the CCB group, in which patients received nifedipine 20 mg twice times daily; and the progesterone group, in which patients received 200 mg of micronized vaginal progesterone once daily. The study was designed as a randomized single-blind clinical trial. This study included 150 pregnant women who were admitted to the Obstetrics and Gynecology Department in Menoufia University in the period between May 2012 and March 2015. Randomization was accomplished by a simple random table on a computer in the ratio of 1: 1: 1. The inclusion criteria were nulliparous women, singleton pregnancy, women with a short cervix less than 25 mm by vaginal U/S (IBE SONATA color Doppler; IBM, Chicago, USA) between 18 and 22 weeks of gestation, healthy with no medical problems (cardiac, renal, or hepatic), and women with 18< BMI< 25. The exclusion criteria included women of 18 years or less, women with previous PTB of less than 34 weeks, women with symptoms of preterm labor (uterine contraction, premature rupture of membranes), women on vaginal or abdominal cerclage, and women with chronic illness. All women were subjected to history taking; full personal, obstetric, menstrual, and medical history was taken. Data were collected in a special form for each patient, full obstetric examination was performed, cervical length (CL) was measured using vaginal probe on empty bladder between 18 and 22 weeks (sonata plus Terason Ultrasound, Burlington, MA, United States), and all women with CL less than 25 mm were divided into three groups: 50 patients received placebo in the form of tonics, 50 patients received CCB in the form of nifedipine 20 mg twice daily, and 50 patients received vaginal progesterone in the form of cyclogest 200 mg pessaries once daily; women with preterm birth were categorized into three categories: very early preterm birth (less than 28 weeks of gestation), early preterm birth (28–32 weeks of gestation), and late preterm birth (33–37 weeks of gestation). All women were followed up until the end of pregnancy in each antenatal visit (every week), either clinically (for signs or symptoms of PTB) or by vaginal sonography for any cervical changes; if any cervical changes occurred, the patient was admitted to the fetomaternal unit for early administration of corticosteroid and application of emergency cerclage. The collected data were organized, tabulated, and statistically analyzed using SPSS software (SPSS Inc., Chicago, Illinois, USA). The exact test was used when the expected frequency was less than 5. P values less than 0.05 were considered statistically significant. All statistical calculations were carried out using the computer program statistical package for the social science (SPSS, version 15; SPSS Inc.) for Microsoft Windows. X mean that the row and column variables are independent, without indicating strength or direction of the relationship. Pearson's χ2 and likelihood ratio χ2 were performed. linear correlation coefficient (r) was used for the detection of correlation between two quantitative variables in one group. Mann–Whitney tests were used for quantitative variables among different groups. P value less than 0.05 was considered significant. Outcome data were available for 150 women, who were divided into three groups: the first group comprised 50 women who received placebo, the second group included 50 women who received nifedipine, and the third group included 50 women who received vaginal progesterone. Age of women ranged from 18 to 36 years, with a mean age of 24.17 years and an SD of 4.55 years [Table 1]. The results were as follows: mean CL for the placebo group was 2.05, mean CL for the progesterone group was 2.052, and mean CL for the CCB group was 2.012 [Table 2]. Among 150 women, 54 (36%) had a full-term birth, 30 (20%) had a late preterm birth, 34 (22.7%) had early preterm birth, and 32 (21.3%) had very early preterm birth [Table 3]. 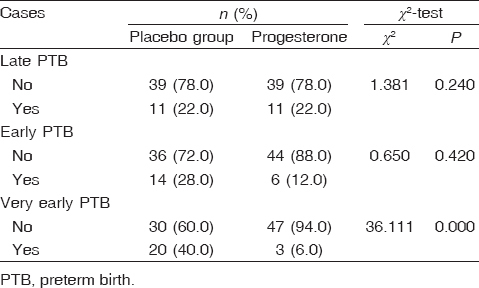 The results were statistically significant among the progesterone group in the prevention of PTB, with a P value of 0.000 [Table 4]. There was no statistically significant difference between cases with no late PTB and cases with late PTB as regards the placebo group and the progesterone group (P = 0.240). There was no statistically significant difference between cases with no early PTB and cases with early PTB as regards the placebo group and the progesterone group (P = 0.420), but there was a statistically significant difference between cases with no very early PTB and cases with very early PTB as regards the placebo group and the progesterone group (P = 0.00) [Table 5]. There was no statistically significant difference between cases with no late PTB and cases with late PTB as regards the placebo group and the CCB group (P = 0.34). 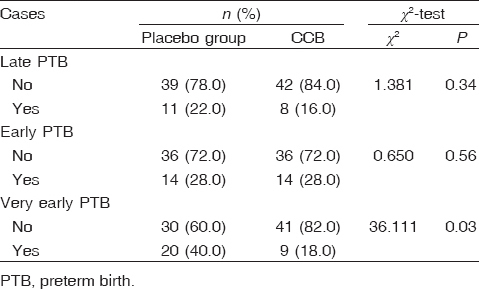 There was no statistically significant difference between cases with no early PTB and cases with early PTB as regards the placebo group and the CCB group (P = 0.56), but there was a statistically significant difference between cases with no very early PTB and cases with very early PTB as regards the placebo group and the CCB group (P = 0.03) [Table 6]. The mean age of the placebo group was 24.76 years, the mean age of the progesterone group was 24.14 years, and the mean age of the CCP group was 23.6 years [Table 7]. Statistically significant results was found in the vaginal progesterone group as regards to prevention of PTB [Table 3] and [Table 4]. These results agreed with the study by Berghella  who used relevant documents, in particular randomized trials, that were identified using PubMed (US National Library of Medicine, 1983 through February 2012) publications, written in English, which evaluate the effectiveness of progestogens for the prevention of PTB. The progestogens evaluated were, in particular, vaginal progesterone and 17-α-hydroxy-progesterone caproate. In addition, the Cochrane Library, organizational guidelines, and studies identified through review of the above were used to identify relevant articles. Data were evaluated according to the population studied, with separate analyses for singleton versus multiple gestations, prior PTB, or short transvaginal ultrasound CL, and combinations of these factors. Consistent with US Preventive Task Force suggestions, references were evaluated for quality based on the highest level of evidence, and recommendations were graded, and they concluded that in women with singleton gestations no prior PTB, short CL of 20 mm at 24 weeks, vaginal progesterone, and the use of either 90-mg gel or 200-mg suppository are associated with reduction in PTB and perinatal morbidity and mortality. The issue of universal CL screening of singleton gestations without prior PTB for the prevention of PTB remains an object of debate. CL screening in singleton gestations without prior PTB cannot yet be universally mandated. Nonetheless, implementation of such a screening strategy can be viewed as reasonable, and it can be considered by individual practitioners, following strict guidelines. In singleton gestations with prior PTB of 20–36 6/7 weeks, 17-α-hydroxy-progesterone caproate 250 mg intramuscularly weekly, preferably starting at 16–20 weeks until 36 weeks, is recommended. In these women with prior PTB, if the transvaginal ultrasound CL shortens to 25 mm at 24 weeks, cervical cerclage may be offered. Progestogens have not been associated with the prevention of PTB in women who have, in the current pregnancy, multiple gestations, preterm labor, or preterm premature rupture of membranes. There is insufficient evidence to recommend the use of progestogens in women with any of these risk factors, with or without a short CL. The results also agreed with the study by Norman et al. , who conducted a double-blind, randomized, placebo-controlled trial of the effect of vaginal progesterone, in which 200 mg was taken daily from 22–24 to 34 weeks of gestation, on pregnancy and infant outcomes in women at risk of PTB [because of previous spontaneous birth at ≤34 weeks and 0 days of gestation, or a CL ≤25 mm, or because of a positive fetal fibronectin test combined with other clinical risk factors for preterm birth (any one of a history in previous pregnancy of PTB, second trimester loss, preterm premature fetal membrane rupture, or a history of a cervical procedure to treat abnormal smears)]. The objective of the study was to determine whether vaginal progesterone prophylaxis given to reduce the risk of PTB affects neonatal and childhood outcomes. They defined three primary outcomes: fetal death or birth before 34 weeks and 0 days of gestation (obstetric); a composite of death, brain injury, or bronchopulmonary dysplasia (neonatal); and a standardized cognitive score at 2 years of age (childhood), imputing values for deaths. Randomization was done through a web portal, with participants, investigators, and others involved in giving the intervention, assessing outcomes, or analyzing data masked to treatment allocation until the end of the study. The results also agreed with the study by Naik Gaunekar et al.,  who included six trials that enrolled 794 women and their babies and all assessed nifedipine as the CCB maintenance therapy. The six trials were judged to be at a moderate risk of bias overall. No differences in the incidence of PTB [risk ratio (RR): 0.97; 95% confidence interval (CI): 0.87–1.09; five trials, 681 women), birth within 48 h of treatment (RR: 0.46; 95% CI: 0.07–3.00; two trials, 128 women), or neonatal mortality (average RR: 0.75; 95% CI: 0.05–11.76; two trials, 133 infants) were seen when nifedipine maintenance therapy was compared with placebo or no treatment. No stillbirths were reported in the one trial that provided data for this outcome. No trials reported on longer-term follow-up of infants. Women receiving nifedipine maintenance therapy were significantly more likely to have their pregnancy prolonged (mean difference: 5.35 days; 95% CI: 0.49–10.21; four trials, 275 women); however, no differences between groups were shown for birth at less than 34 weeks of gestation, birth at less than 28 weeks of gestation, birth within seven days of treatment, or gestational age at birth. No significant differences were shown between the nifedipine and control groups for any of the secondary neonatal morbidities reported. Similarly, no significant differences were seen for the outcomes relating to the use of health services, except for in one trial, in which infants whose mothers received nifedipine were significantly more likely to have a longer length of hospital stay as compared with infants born to mothers who received a placebo (mean difference: 14.00 days; 95% CI: 4.21–23.79; 60 infants). This study concluded that vaginal progesterone was better than nifedipine in the prevention and treatment of PTB in women with a short cervix; it was also concluded that nifedipine is not recommended to be given for long periods in the prevention of PTB, as its side effects on mother and fetus has not been well studied. World Health Organization (WHO). Recommended definitions, terminology and format for statistical tables related to the perinatal period and use of a new certificate for cause of perinatal deaths. Modifications recommended by FIGO October 14 1976. Acta Obstet Gynecol Scand 2011; 56:247–253. Kuehn BM. Groups take aim at US preterm birth rate. JAMA 2006; 296:2907–2908. Smith GC, Shah I, Pell JP, Crossley JA, Dobbie R. Maternal obesity in early pregnancy and risk of spontaneous and elective preterm deliveries: a retrospective cohort study. Am J Public Health 2007; 97:157–162. Challis JR, Sloboda DM, Alfaidy N, Lye SJ, Gibb W, Patel FA, et al. Prostaglandins and mechanisms of preterm birth. Reproduction 2002; 124:1–17. Lopez Bernal A. Mechanisms of labour – Biochemical aspects. Br J Obstet Gynaecol 2003; 110 (Suppl 20):39–45. Mesiano S. Myometrial progesterone responsiveness and the control of human parturition: J Soc Gynecol Investig 2004; 11:193–202. Wray S, Jones K, Kupittayanant S, Li Y, Matthew A, Monir-Bishty E, et al. Calcium signaling and uterine contractility. J Soc Gynecol Investig 2003; 10:252–264. Liao P, Yu D, Lu S, Tang Z, Liang MC, Zeng S, et al. Smooth muscle-selective alternatively spliced exon generates functional variation in Cav1.2 calcium channels. J Biol Chem 2004; 279:50329–50335. Berghella V. Progesterone and preterm birth prevention: translating clinical trials data into clinical practice. Am J Obstetr Gynecol 2012; 206:363–450. Norman JE, Marlow N, Messow C-M, Shennan A, Bennett PR, Thornton S, et al. For the OPPTIMUM study group. Vaginal progesterone prophylaxis for preterm birth (the OPPTIMUM study): a multicentre, randomised, double-blind trial. Lancet 2016; 387:2106-2116. Naik Gaunekar N, Raman P, Bain E, Crowther CA. Maintenance therapy with calcium channel blockers for preventing preterm birth after threatened preterm labour. Cochrane Database Syst Rev 2013; (10):CD004071. doi: 10.1002/14651858.CD004071.pub3.